Yay, a new holiday, International TableTop Day! 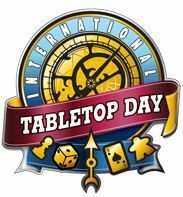 The International TableTop Day web site has an interactive map of locations that are participating. If you want to start your own event, you can submit it to the site, and garner some cool promotional items for the trouble.